Joyce Wycoff Connecting through Art: Did a dream change Mexico’s art forever? Purple-dotted three-headed dragons, orange-striped unicorns, multicolored armadillos, a turquoise-winged owl with a human face. Where do all these brightly painted mystical, fantasy creatures come from? Called alebrijes (Spanish pronunciation: [aleˈβɾixes]), this popular form of Mexican folk art stems from one man’s dream … well, maybe. 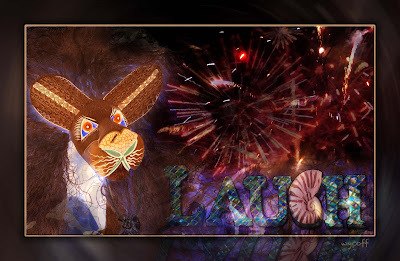 While he was in bed, unconscious, Linares dreamt of a strange place resembling a forest. There, he saw trees, animals, rocks, clouds that suddenly turned into something strange, some kind of animals, but, unknown animals. He saw a donkey with butterfly wings, a rooster with bull horns, a lion with an eagle head, and all of them were shouting one word, "Alebrijes". 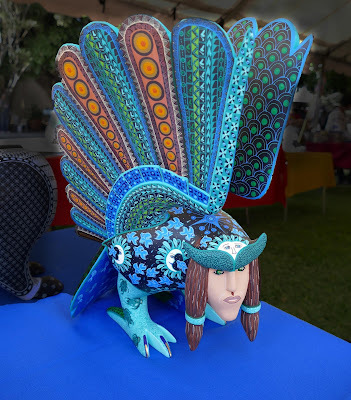 Upon recovery, he began recreating the creatures he saw in cardboard and papier-mâché and called them Alebrijes. Pedro Linares was a cartonero (papier mache crafter) from La Merced a neighborhood in Mexico City. He made a living by making pinatas and judas like his father before him. Linares was appointed by painter José Gómez Rosas aka El Hotentote to make some "alebrijes" to decorate the annual masquerade party at the San Carlos Arts Academy. When Linares asked how to make such things, Gomez Rosas replied "just grab a judas (giant, exploding figures of Judas) and give him a tail and bat wings". In Gomez Rosas paintings there were often zoomorphic and fantastic figures that combine reptile, bird, insect and mammal parts as well as different eras and painting styles. 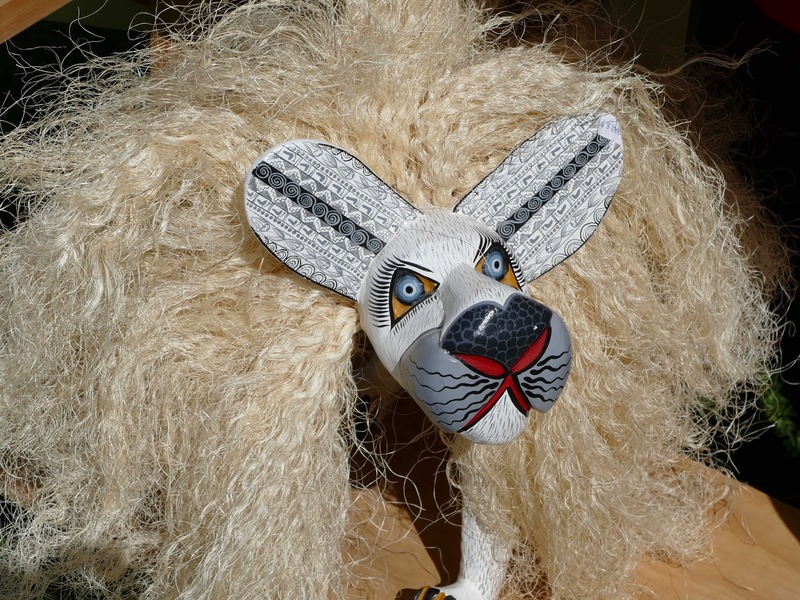 Whether from a dream or from an art request, Linares developed the first alebrijes which now show up in all art markets in Mexico. However these brightly painted fantasy creatures might not have become the beloved Mexican folk art favorite if it hadn’t been for artists Diego Rivera and Frida Kahlo and a filmmaker. 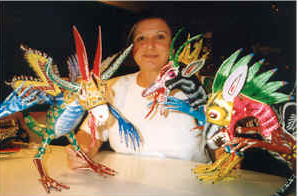 In the 1980s, British filmmaker, Judith Bronowski arranged an itinerant Mexican art craft demonstration workshop in the US and helped bring many Mexican folk artist to public attention through her films. Mexican folk art has come along way since the days when Linares crafted his first alebrije. Until the 1970s, Mexican folk artists seldom signed their work, remaining anonymous and poor. Now it is illegal to sell crafts made in Mexico without acknowledging the community and region they are from, or to alter the crafts in a way that could be interpreted as damaging to the culture’s reputation or image. The Feria Maestros del Arte in Chapala, Mexico, has become one of the premier supporters of Mexican folk artists with a three-day fair where traditional artists can show their art to buyers drawn from all over the world. The carefully selected artists at this fair pay no space fee or commission and the fair organizers pay transportation costs and organize housing for the artists while they are at the fair. Creativity is a contagious thing and I seem to catch it looking at art that inspires me. The same artists who created Bújo Nahual shown above, created a wonderful creature that captured me all during the recent Feria Maestros del Arte, although my budget wasn't big enough to bring him home with me. "Time to Laugh" was stimulated by this alebrije and a "Laugh" sign I saw in a home on the recent "Behind the Walls" tour here in Ajijic.